First broadcast on New Year's Day 2007, The Sarah Jane Adventures was the second spin-off TV series (after Torchwood) created by Russell T. Davies in the wake of Doctor Who's successful revival in 2005. The series followed classic series companion Sarah Jane Smith (Elisabeth Sladen) and her adventures on Earth after her travels with the Doctor. Unlike Torchwood which was targetted towards an adult audience, SJA was very much aimed at the younger end of the spectrum, and accordingly aired on CBBC (the Children's BBC channel) and during a pre-teatime slot on BBC1. SJA was well-received by both critics and audiences, and continued until 2011, when Elisabeth Sladen's illness caused production of the 5th series to be halted halfway through. Sadly Elisabeth died in April 2011, bringing the show to a premature end. From 2007 to 2011, a total of 13 novelisations were published. Similar to the classic Doctor Who Target novelisations, these were all adaptations of TV episodes — no original novels were produced. The main range consisted of 9 novelisations from 2007-2009, published by BBC Children's Books. After this range was halted, two further episode novelisations were released as e-books in 2010 (not listed on this site as I don't list digital-only releases): The Nightmare Man and Death of the Doctor. The final 4 tie-in novels were published in September 2010 by UK publisher Pearson, as part of their "Bug Club" children's literacy range — although these were also adaptations of TV episodes, they differed by being "photo novelisations" (i.e. photographs used to illustrate each page) and were also much shorter (24 pages, vs. the previous novels' 128 pages). The only other SJA tie-in book ever published was a quiz book in 2009 (listed in a separate section as of this site as it's not a novel). Those looking for original Sarah Jane Adventures fiction should be aware that a series of 10 audiobooks were also released from 2007-2011: this time instead of being episode adaptations, they were readings of original fiction written specially for audio. 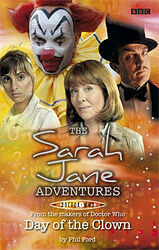 These are listed on the Sarah Jane audios page.